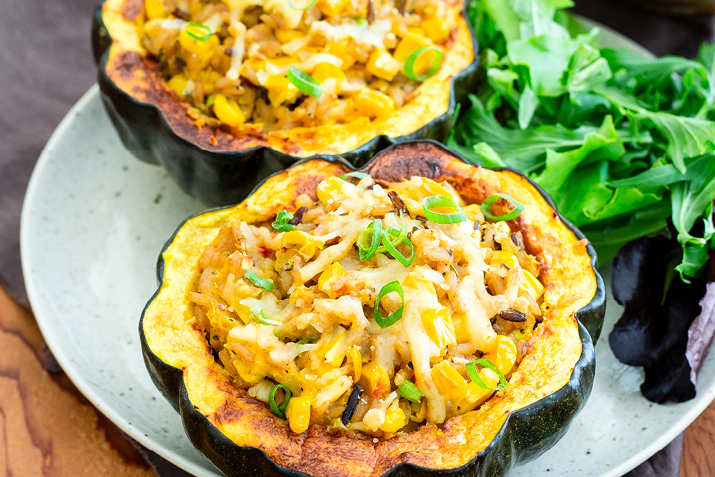 Chewy, nutty wild rice is seasoned with herbs and cheddar in these delightful stuffed squash halves. Heat the oven to 400°F. Lightly oil a large sheet pan. Cut the squash in half lengthwise and scoop out the seeds. Place the squash, cut side down, on the pan. Bake for 25 to 30 minutes, until the squash is tender when pierced with a paring knife. When the squash is tender, place on a rack until cool enough to handle. While the squash is baking, bring 2 cups of water to a boil and add the wild rice blend. Return to a boil and cover, then reduce the heat to low. Cook for about 30 minutes, or according to package directions. Remove from heat and let stand, covered, for about 5 minutes, then transfer to a large bowl to cool. Scoop the flesh from the squash, leaving about a quarter-inch inside the shells so they won’t collapse. Put the squash flesh in the bowl with the rice. Add the corn, scallions, Dijon mustard, sage, thyme, pepper and salt. Mix well, and when cooled to room temperature, stir in about two thirds of the cheese. Spoon the squash mixture back into the shells and place on the sheet pan. Cover with the remaining cheese. Reduce the oven temperature to 350°F., and bake for about 30 to 35 minutes until the cheese is golden brown and the squash is heated through. Serve hot.